Following up on the last post in this series, on Huntsman tweed, this runs through the style of a shooting suit and being measured. The suit shown here is three-button, but I opted for a more classic Huntsman one-button front in order to make it better for wearing casually. While I hope one day to wear the suit for shooting, I think with the five-button waistcoat underneath it will be warm enough. What will also help is the weight of the cloth (14-ounce) and the neck closing on the jacket, which features a buttoned-back tab under the collar and facing button to secure to. This is a feature I have on a couple of my casual suits, though I normally combine it with a button under the lapel as well. Additional buttons are found above the hip (bellows) pockets as well, so that the flaps can be buttoned back for rapid access. 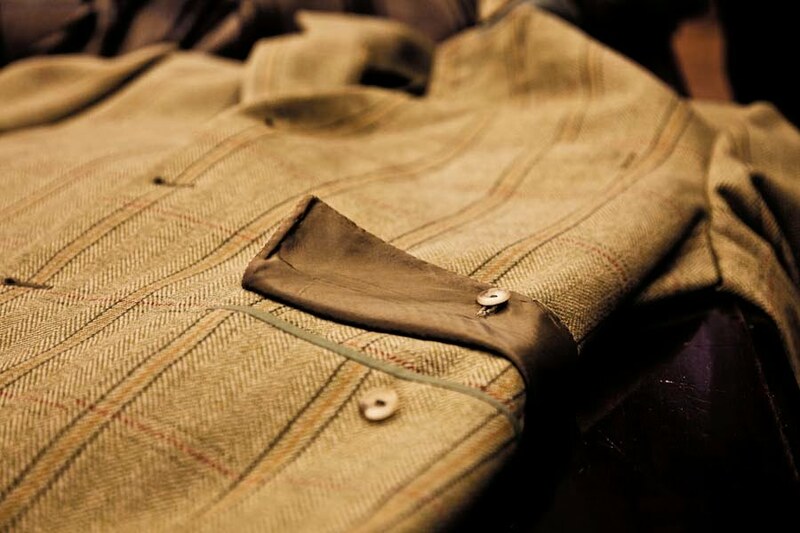 Other pockets include a poacher’s pocket on the inside of the jacket and four on the waistcoat – what is known as a postboy’s waistcoat. Unlike the example shown here, however, I will have no flaps on the lower pockets as they are unlikely to be used when actually shooting. The back of the jacket will feature pleats (known also as an ‘action’ or ‘bi-swing’ back) to make it easier to raise one’s arms to shoot, and a purely decorative half belt. The sleeves will also be cut slightly larger – a ‘dirty’ sleeve – in order to help that shooting action. 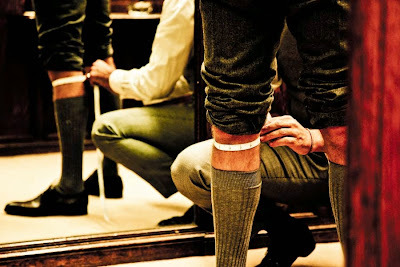 The choice between plus-fours and plus-twos is largely a personal one. I went with plus-twos merely to have less material around the knee. And side straps on the waist. The plus-twos required one extra measurement in the fitting room: the top of my calf, which meant rolling my trousers up for David Ward to see them properly. All of a sudden I felt rather like a schoolboy. The long socks and flannel trousers didn’t help. David will be cutting my suit. He has just this week joined Huntsman from Norton & Sons as a cutter. Readers with long memories will remember flattering words about David from Patrick Grant, owner of Norton & Sons, in a previous interview with Patrick on Permanent Style. 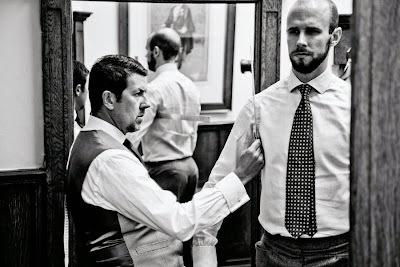 I was impressed with the exacting measurements, which were both more numerous than other tailors and involved a few little quirks. Unlike elsewhere, David kept my jacket on for the majority of the measuring (something mentioned in Richard Anderson’s fond memories of Huntsman in his recent book), used a square rule placed under my armpit to judge the size of the sleeve head, and took three photographs – front, side and back. Interestingly, he also pinned the centre point between my shoulder blades, once found, and used that as a starting point for several measurements. The same was done for the small of my back. 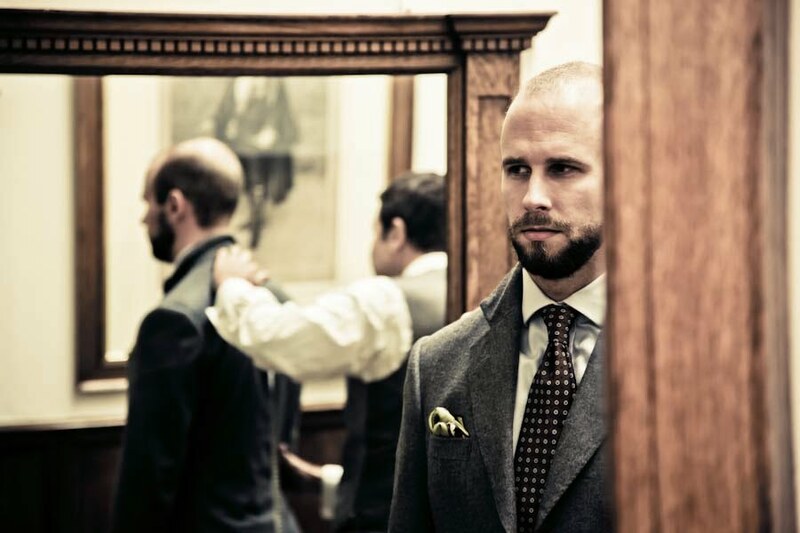 You can follow the discussion on Huntsman tweed suit: Part 2 by entering your email address in the box below. You will then receive an email every time a new comment is added. These will also contain a link to a page where you can stop the alerts, and remove all of your related data from the site. I’ve got to ask, regarding the choice of jacket button: how does the placement of the single-button compare to where each of the three on the original jacket are placed? Would it wear similarly with just the middle or top button done, or is the lapel crease on the stiff side? I would imagine that flannel would roll to a 3/2 sort of appearance rather easily. 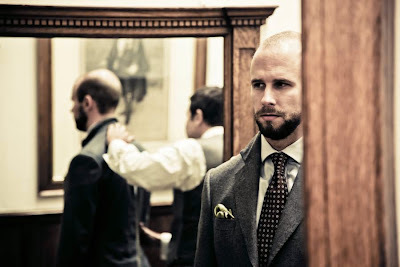 What type of suit, shirt, necktie, pocket square, and shoes are you wearing in the above photographs? I am greatly sorry to hear that David Ward has departed Norton & Sons for Huntsman. 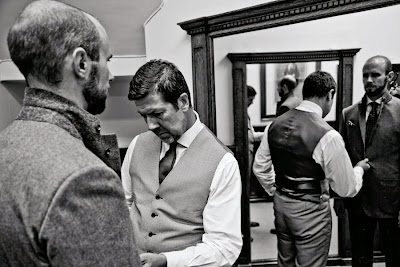 When I watched the BBC4 documentary on Savile Row a few years back, he and Patrick Grant struck me as the most knowledgable and approachable of the people featured (though I was also impressed with crew at Anderson and Sheppard) and it was my hope that, when I could afford it, I would purchase my first bespoke suit from them. I was especially pleased when I learned that Mr. Ward had joined Norton from Poole. I wish best of luck with new suit and look forward to following its progress. Sorry Simon— I just don’t get the one-button idea at all!! Will be waiting to see how that plays out. Which raises the question: How many buttons on sleeve? I think you are simply intent upon the job at hand. 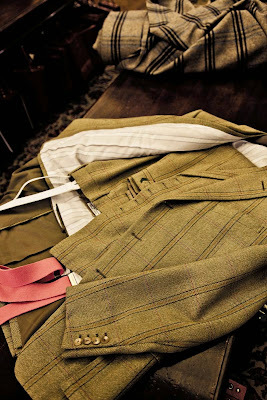 On the one-button: have a look at the last Huntsman post on the tweed suit there. That is how it will look. A beautiful bespoke suit requires a beautiful “bespoke” gun. Looking forward to a series about you ordering a London Best gun. Start saving! Could you tell me what is meant by plus-fours and plus-twos? Great photos of the process! Hi Derek – they indicate how many inches the short trouser drops below the knee. Lovely to see the traditional craft of cutting a shooting suit covered on this informative website! 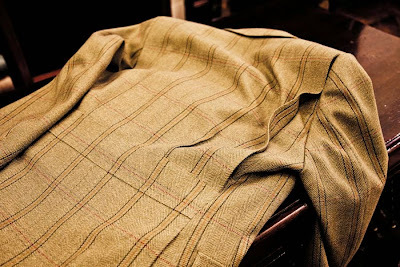 Beautiful tweeds, will the final jacket have a shooting vent on the sides of the back or in the centre? A pleasant surprise to see my cutter David Ward getting down to what he does best……………Cutting a Savile Row suit. I didn’t know he had moved to Huntsman? although i believe it was only a matter of time due to a lack acknowledgement for giving Nortons a good shake from the inside and putting it back on the map on Savile Row. Norton’s success to those in the know is down to Ward. That acknowledgement sadly seemed consistently placed on the head of another. Looking forward to the finished article Simon.